I was never a fan of Mac n cheese. In fact I never really saw what the big hoopla is all about. I guess the ones I’ve tasted were mostly of packaged products. The taste was alright, texture was mediocre, and I often thought that they should use less orange or yellow food colouring in it. But hey, maybe it is deliberated to attract children’s attention. You know what, it seems to be working! Children are crazy about Mac n Cheese. Just not this one. 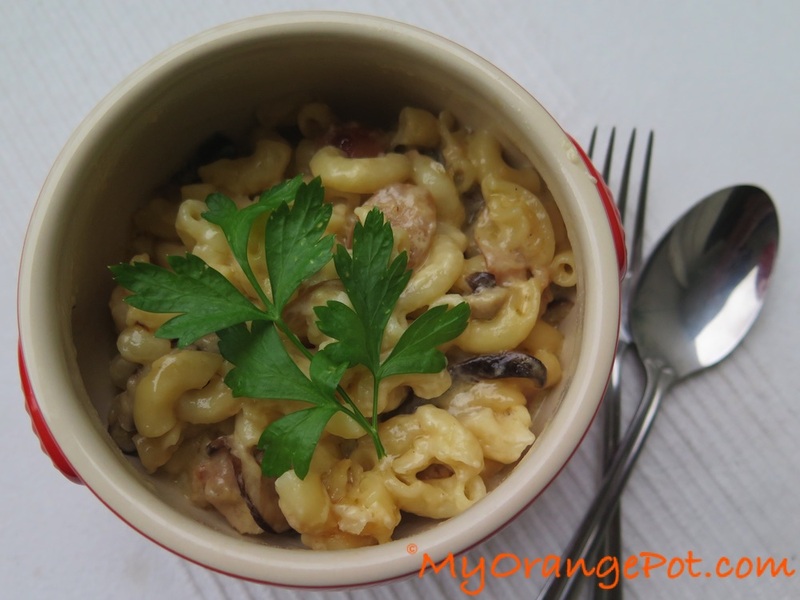 Many versions of Mac n Cheese I have tried since, from packaged ones to homemade ones. I have even tried to order some at restaurants. Sure, there are some who are better than others, but nothing blew my mind. My opinion on the matter remain unchanged. 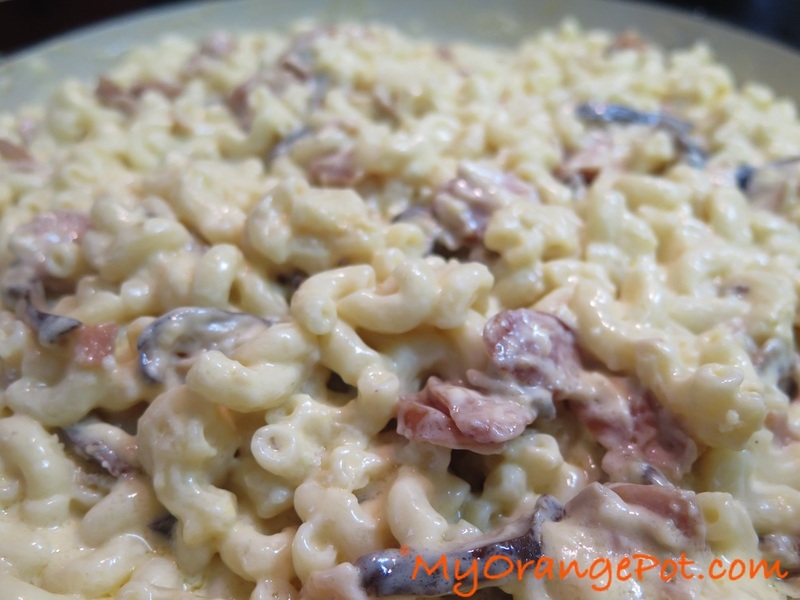 Until a couple of weeks ago I watched an episode of Masterchef Australia’s Masterclasses – where an esteemed chef Marco Pierre White gave a class on his take of Mac n Cheese. He talked through his process in making the dish, with the rationale on why each of the step and ingredients are important. I was hooked looking at it, with the type of cheese used and addition of multiple mushrooms, the creamy bechamel sauce, I can’t help but told myself I must try to make it because it looks so darned delicious! The original MPW recipe is available here for you to peruse. But as always, I tweaked it to match what I have in my pantry and fridge with some protein addition that I believe had brought the flavour to another level! A few of my regular taste tester had tried this and all approve. And my little friend Quinn has also gave me his stamp of approval. Enak!!! (Enak = delicious in Bahasa Indonesia). Meanwhile melt butter in a large cast iron pan over a medium heat (I used my 30cm Le Creuset round cast iron casserole). When melted add flour and whisk to cook out roux – about 3-4 minutes. Gradually add cold milk while whisking, allowing mixture to come to a boil. Add cheddar and mascarpone cheese, whisk to combine. When pasta is cooked, drain and add to cheese sauce. Season with salt and pepper. Meanwhile in a separate frypan, melt 3 Tbsp butter over medium heat. Add brown & white mushrooms and sausage – fry until wilted. Add onion and garlic and cook until fragrant. Add soaked mushrooms and julienned turkey meat and stir to combine. Remove from heat and stir into macaroni mixture and grated parmesan. Serve in individual bowls with parsley for garnish. Bechamel sauce, ready to be spiked with the extra goodies!